Part of the reason that Newcastle developed to become the vibrant and bustling city that it now is stems from its location on the River Tyne. 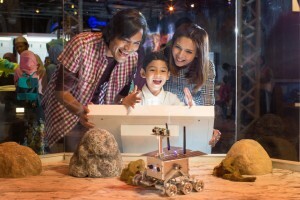 This placement offered it great opportunities to export the raw materials created here to the wider world, and secured the city a peerless international reputation. In order to get from one side of the river to the other, however, it soon became necessary to construct a bridge; and as the city grew, so too did the demand for bridges. 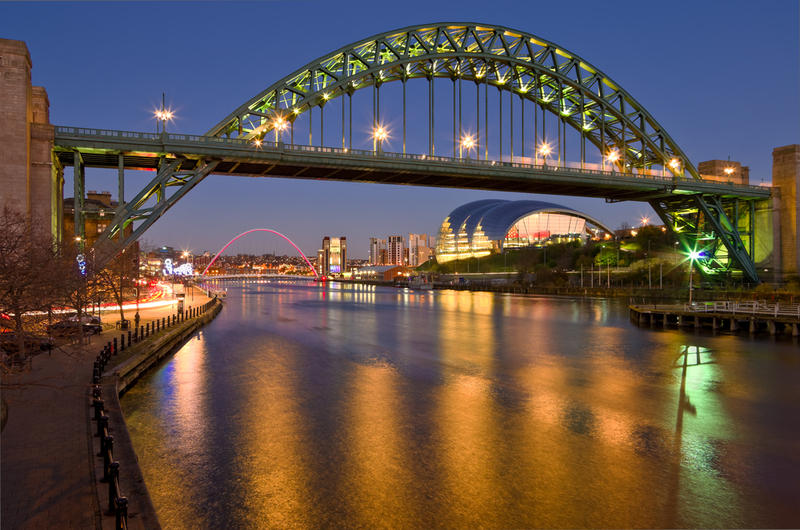 At present, there are seven bridges spanning the Tyne within the city’s limits. Let’s take a look at them. This enormous green bridge was opened to the public by George V in 1928. Its gigantic green arch is one of the defining structures of the city. It measures 389 metres from end to and, and was repainted in green in the year 2000 to match the original colour scheme. Whether you’re staying in the city for a weekend, or you’re lodged in Newcastle Uni accommodation for the next few years, you’ll want to make a point of visiting this part of the city. This intruiging bridge uses hydraulic power to move itself to allow boats to pass from one side to the other. It’s able to rotate all the way through 360° of motion, and came to be in 1876, replacing an older bridge at the same location. When it was first constructed, it was the largest swing bridge anywhere in the world – and it remains an impressive sight when it’s in motion. This road and railway bridge is made from just over five-thousand tons of iron, and was opened by queen Victoria in 1849. As such, it represents an imposing emblem of the city’s industrial heritage. You’ll find it just outside the city, on the way to Gateshead. This bridge is sometimes known as the ‘winking eye bridge’, owing to the shape of its suspension supports, and the way that it tilts. The bridge was installed in 2001, lifted into place in a single piece by one of the world’s largest cranes. It’s capable of 40° of rotation from closed to open, enough to allow ships to pass beneath. The bridge is remarkably energy efficient, and costs just a few pounds every time it opens and closes. This bridge was purpose-built along with the Tyne and Wear Metro system. It came to be on the 6th of November 1981, just nine days before regular Metro services began to move along it. The metro line is, as you might expect, underground, only emerging from the tunnels in order to pass over the river. The sight is far more impressive than an underwater tunnel might have been. This Grade II listed structure spans the river between Newcastle and Gateshead. It comprises four lattice-steel spans, which rest on top of concrete pillars. It was built in order to allow trains to pass in and out of Newcastle central station without having to reverse. Previously, trains would enter the station via the High Level Bridge – but from there they’d have no means of moving out of the station. The opening of the bridge by Edward VII in 1906 changed all that! This bridge crosses the River Tyne to the west of the city, and carries the A189 road. Three bridges have been built at this location, each replacing the last. The first came to be in 1871, thanks to the work of builder Richard Cail and Thomas Bouch, an engineer who created the Tay Bridge in Scotland, which notoriously collapsed. This first bridge was replaced, with the second incarnation coming to be in 1901. But by the 1960s this replacement bridge was shown to be wanting, as it began to sway in high winds. The speed of crossing vehicles was limited to 10mph. Eventually, in 1983, the bridge which now occupies the spot was constructed. 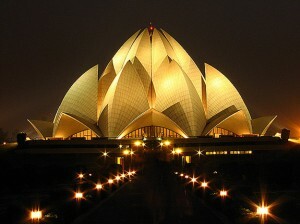 It was opened by the Princess of Wales, and has been built to bend in the face of impact. Its designers purport that it’s able to withstand a ramming by a large container vessel – but this claim is unlikely to ever be tested, as ships of that sort rarely venture this far upriver. 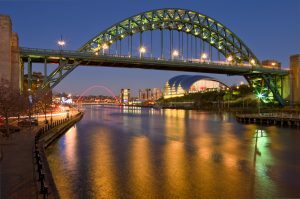 Most of these bridges are just a short trip from your hotel or student housing in Newcastle city centre – and they’re well worth making the time to visit!